Millennials differ from their boomer parents in many ways, but today we take a look at the topic of finance and how monetary matters impact this demographic. According to Investopedia, U.S. millennials feel that they will not be able to achieve material goals like finding their dream job, buying a house or retiring at the age their parents did. What else do we know about this generation tackling adulthood? 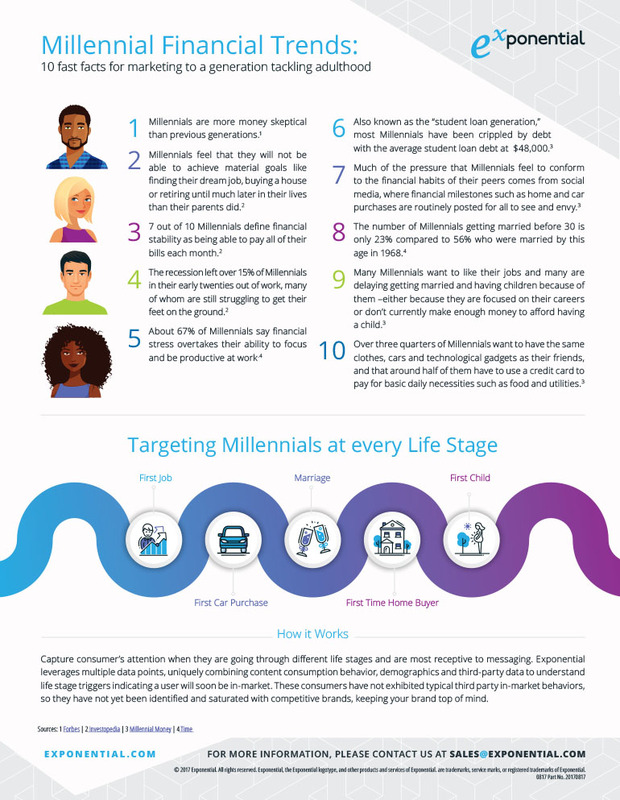 Exponential compiled 10 Millennial Financial Trends to understand millennials’ views on their finances as they enter new life stages. Check out the factoids below and on our website. Contact Exponential to hear how we can help brands and advertisers target millennials at every life stage.